This title provides a wealth of resources to help teachers integrate the digital board into their classrooms. It provides ideas for using regular programs and software, as well as offering suggestions on how to create specifically-tailored resources. The clear organisation means that activities are categorised according to skill focus, making them easy to locate. It also contains suggestions for project work, 'learning to learn' activities and 'the connected classroom'. It presents a fully comprehensive resource pack of activities for using the interactive whiteboard, provides systematic coverage of skills to enhance and support students' learning, includes guidance on a range of technological approaches for all levels of experience. 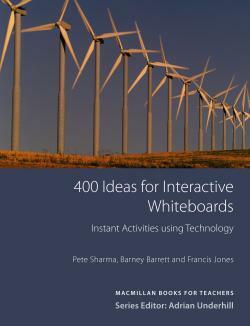 It is for teachers who are already using interactive whiteboards and who want to discover new and innovative ways to use them and for teachers with little experience or who feel unsure about how to use them most effectively in the classroom.